Today is the last day of school for Williamson County students. While kids and their parents are gearing up for fun, the FPD is ready to help keep Franklin families safe this summer. 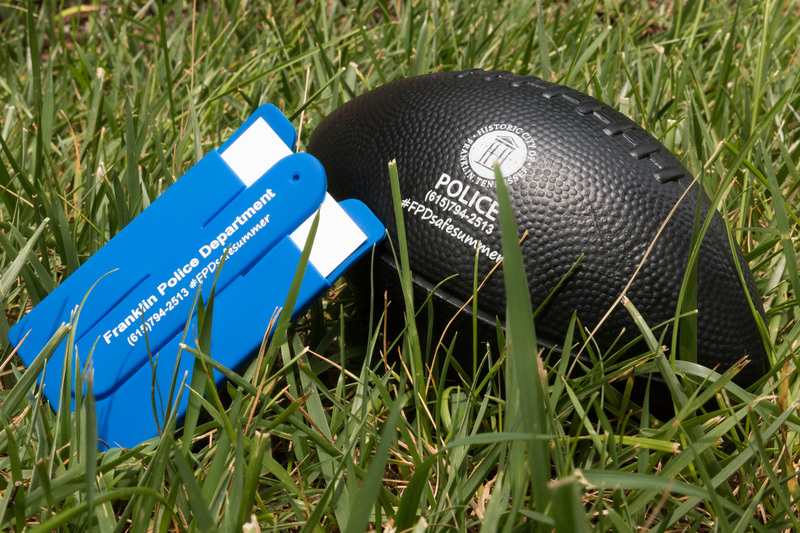 Officers are giving away footballs and cell phone pocket stands with the FPD’s non-emergency number in case you need to ask us a question or report suspicious activity. The giveaways are printed with the hashtag #FPDsafesummer, which will be used throughout the season on @FranklinTNPD Twitter to highlight summer safety messages. “Summer is a special time,” said Chief Deborah Faulkner. “We want Franklin families to have fun and make incredible memories – and we want them to stay safe while they do it.” Franklin Police Officers will be stepping up patrols in neighborhoods, focusing on speed and traffic safety, and increasing visibility in places like the City’s parks and shopping venues. While many are getting ready to travel this summer, Franklin Police Officers are offering a little extra peace of mind. While you are away, neighborhood officers will help keep an extra eye on your home.